Put the ox cheek, finely chopped onions and garlic, thyme, crushed black peppercorns and bay leaves, wine and port and dehydrated cepe mushrooms into a large casserole dish, add a large pinch of salt and bring to the boil. Cover and cook in the oven for 3 hours, until the meat is tender. Once cooked, remove the ox cheek and keep warm. Strain the sauce through a fine sieve and bring the sauce to a simmer and reduce to the consistency of a syrup then add the ox cheek. Peel and cut the carrots in half and parboil in boiling water with 50g butter for 5 minutes or until nearly soft. Drain, cover and set aside. You will reheat the carrots before serving with the remaining butter, turning over a low heat in the butter until tender. To make the crushed potatoes, cook the potatoes in their skins in boiling water until soft and the skins begin to split. Drain and peel the potatoes. Crush the potatoes with a fork adding the diced butter, season with salt and pepper. To make the crispy kale, cut the kale into small florets (it may be bought already prepared like this) and mix with the olive oil, cook at 150°C in the oven for 5 minutes until crispy. 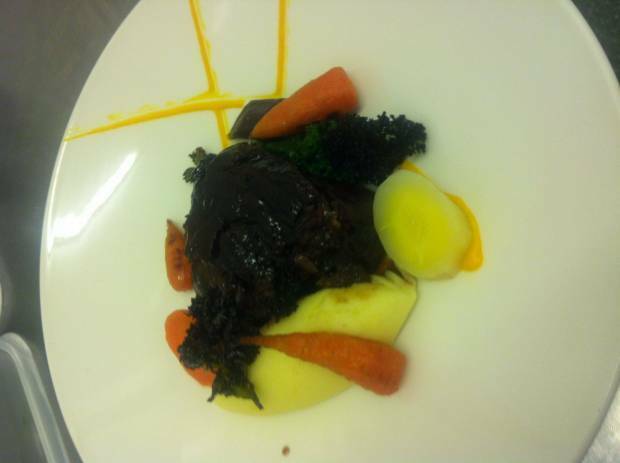 Spoon the crushed potatoes in the centre of a shallow plate, place the ox cheek on the top, and add the carrots and the crispy kale, drizzle over the cepe sauce.